My friend Florin Citu has a new blog post on monetary policy failure in Romania. 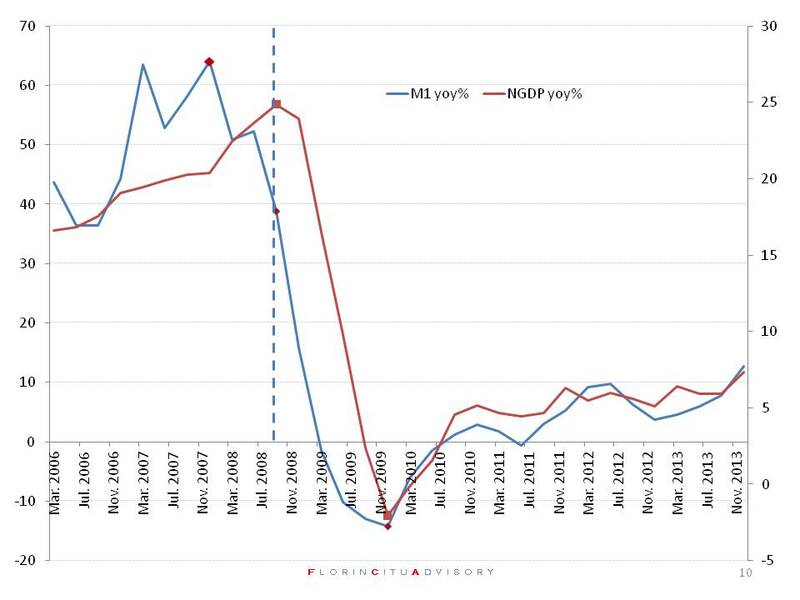 …monetary policy was pro-cyclical- high money supply growth (M1) until December 2007 and an abrupt decrease to negative money supply growth after that. The peak of money supply growth is in December 2007 while the peak of NGDP growth is in September 2007. In the 9 months money supply growth decreased from 64% per year to 38% per year. Most importantly, the minimum for both money supply growth and NGDP growth is in December 2009 (one year after the exogenous negative shock of October 2008). Monetary policy continued to remain tight for a long period after October 2008 while most of the global central banks were relaxing monetary policy or at least keeping money supply growth constant. …monetary policy targeted mainly the exchange rate and only secondary inflation. It is true that the exchange rate has been less volatile but it did follow the pattern we observe in countries with currency boards: relative stability followed by a big devaluation. However, relative exchange rate stability came with a big real cost for the economy: volatility in the interest rates and inflation. Interest rate volatility, especially in the interbank market, represented funding costs uncertainty for banks which was transferred to clients via higher premium for the RON lending market. An unintended consequence of this policy was that it made foreign exchange loans more attractive. Thus interventions in the FX market acted as a subsidy for both supply and demand of FX denominated loans. Bottom line, FX interventions were not free and worst of all were also pro -cyclical with real costs for the economy. Again Florin is completely right. The Romanian central bank was clearly preoccupied with the development in the currency markets. As the crisis hit there was a global spike in dollar demand and as a result investors were selling basically all other currencies. This was also the case for the Romanian leu (RON)). But what caused the central bank to have this fear-of-floating? I think the answer is that the Romanian central bank did not have the proper monetary policy target and failed to focus on one target. A large amount of Romanian households and corporations had foreign currency loans in 2008 (and still do). The Romanian central bank clearly feared that this foreign currency exposure could trigger a financial crisis if the leu was allowed to drop sharply. As a consequence the central bank moved to tighten monetary policy dramatically to “defend” (which is nonsense in free floating currency regime) against what the central bank believe was a “speculative attack” (this is also nonsense – floating exchange rates do not come under “attack”). The monetary tightening caused the sharp de-acceleration in the money supply, which in turned caused a sharp contraction in nominal GDP. So yes, the central bank was trying to protect households and companies with foreign currency loans, but also at the same time sent the Romanian economy into a deep recession. A recession that Romania has not fully emerged from. I still fail to why the Romanian central bank saw it as it’s task to effectively protect those who had speculated in foreign currency loans rather than ensuring nominal stability. By effectively trying to bail-out households and companies with FX loans the Romanian central bank has increased moral hazard problems, but at the same time kept the Romanian economy on a “low growth path”. The Romanian monetary policy failure over the past five years is yet another example of what happens when central bankers try to play firefighters rather than sticking to transparent rules to ensure nominal stability. If you asked me for advise then the Romanian central bank should adopt a NGDP target and the let the leu float freely without an interference from the central bank. PS I should say that I think that the Romanian economy is now in a moderate recovery (See more here). This I believe is mostly a result of imported monetary easing on the back of the easing of the euro crisis. However, the Romanian central bank does not have to rely on the actions of the ECB and the Fed to bring out of the crisis. The Romanian central bank is fully able to control nominal spending in the Romanian economy. You think +3.5% real GDP growth is below potential for Romania? What do you think potential is? What about the banks who gave out the loans in fx during the boom years? They were bailed out too, like in the rest of the world. If the central bank had allowed the households and companies with fx loans to default, there would have been a banking crisis which might even have spread further into Europe and the eurozone (as most of the banks in Romania are owned by foreign banks). So I don’t think it was a case of bailing out the households and companies that had taken out fx loans (remember that Romania is one of the few countries in Europe that doesn’t have a personal bankruptcy option, that is, if you take out a loan you cannot go bankrupt, you carry it for life) as much as it was a case of avoiding a financial crisis that could have spread, by helping out the commercial banks.